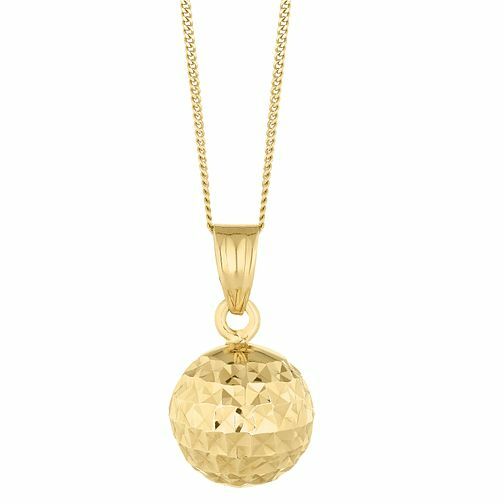 This 9 carat yellow gold diamond cut ball pendant is the perfect jewellery box essential. Its unique design makes this necklace the ideal accessory for any look, giving simple elegance and grace to any style. 9ct Yellow Gold Diamond Cut Ball Pendant is rated 3.7 out of 5 by 3. Rated 1 out of 5 by Anonymous from Chain far too thin I was given this necklace as a christmas present but after only a few uses the chain broke. I purchased a replacement as I liked it so much, and after a few uses the chain broke again! Highly disappointing as I am not heavy handed at all. I would not recommend anyone buys this necklace. Rated 5 out of 5 by Anonymous from Looks nice I bought it for my birthday.I am happy of it.alooks really nice.Good price.